Full featured ASP .NET WEB application for management of clients, programs, orders and licenses with flexible automated activation system for programs protected with PC Guard Software Protection System family products. Activation center (ACEN) is available in two different versions: Source code version (with full asp .net source code, freely modifiable) and Pre-compiled version (precompiled, without ASP .NET source code). All PC Guard family products are supported by both versions. Activation center is installed on your own server and fully controlled by your staff. Turnkey deployment service is also available as optional purchase so you can let our technical support deploy it for you and get it ready for first use. Activation center (ACEN) is royalty free. There are no limitations related to number of clients, orders, programs or licenses you can manage. ACEN is licensed per server and each server requires separate license. Detailed pricing information is available in our online store. If you are interested in testing Activation center (ACEN) please request access to online demo version of Activation center. You will receive login information for both administrator and client interface so you can fully test all available features. Administrators: Administrator users can add/modify/delete information about Programs, Clients, Orders, Licenses and Web licenses, manage database users, groups and authorization profiles, review audit logs, set activation rules... Clients: Clients can manage their licenses (activate, reactivate, remove and transfer) and personal information 24/7 online. If required, manage clients, orders, licenses and web licenses directly from any protected application. 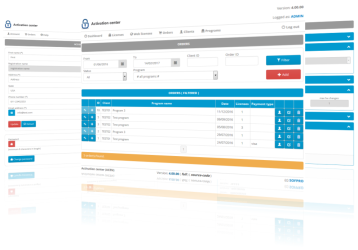 ACEN allows you to manage information about your clients, programs, orders and licenses. Manage unlimited number of administrator users, clients, orders, programs and licenses. Activation center is installed on your own server and fully controlled by your staff. Choose different licensing model for each program accordingly to your specific needs. Each license is identified by Customer, Order and Program and requires valid client account and order data in activation center. Each license is identified by Program and Serial Number pair only. No customer or order data is required. Clients can manage their licenses (activate, reactivate, remove and transfer) and personal information 24/7 online. Let clients create new accounts and add new orders with valid serial numbers. 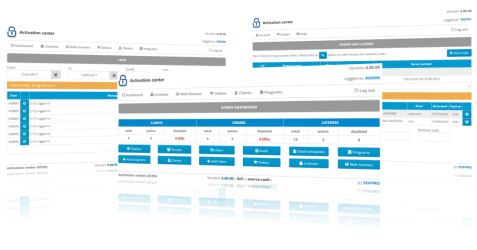 Authorize administrator users per your own requirements. Freely modify source code version to suit your specific needs. 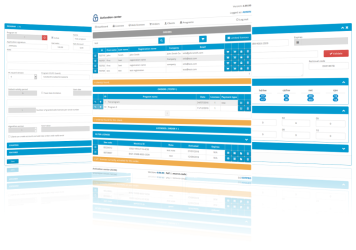 Manage clients, orders, licenses and web licenses directly from protected application. ACEN fully supports serial numbers feature. Control and track limited licenses. All PC Guard family products are supported by ACEN.